Ever wondered how to make almond milk? It’s incredibly easy requiring only a soak of the almonds, a robust blend, and a good drain. I just learned a few different techniques from a new cookbook: The Almond Milk Cookbook by Alan Roettinger. I also learned about a hundred ways to use the delicious milk in a wide variety of recipes. The earliest almonds were discovered in China and carried down the silk road to other countries. Spanish missionaries settling in California brought them to North America. And almond milk — the combo of finely ground almonds and water — has been enjoyed from Europe to East Asia at least as far back as the Middle Ages. The USDA says a serving of almonds is 1 ounce, 1/4 cup, or a handful — about 23 nuts. And one ounce of whole, shelled almonds contains 163 calories, about 14 grams of fat, 6 grams of protein, 6 grams of carbohydrates, and 3.5 grams of fiber. Almonds are a healthy treat. One serving provides 173% of your recommended daily dose of vitamin E and 78% of riboflavin (aka vitamin B2). It’s chock full of essential minerals like copper, iron, magnesium, manganese, phosphorus, and zinc. Almond milk is also high in antioxidants, particularly vitamin E. It contains no saturated fats and no cholesterol, so it’s a healthy choice when compared with cow’s milk. Almond milk has more vitamins and minerals than soy and rice milks. It’s also gluten-free. And it’s incredibly simple to make at home! The Almond Milk Cookbook provides a few recipes for almond milk and cream. All include natural almonds and water in varying proportions. Soak the almonds in water for 8 to 12 hours. Drain and rinse them. Put them in a blender with the water and whir them up. Strain the almond milk from the pulp using a nut bag or a couple of layers of cheesecloth. Et voilà! For basic almond milk, use 1-1/4 cups soaked almonds and 4 cups of water. For rich almond milk, use 2 cups soaked almonds and 4 cups of water. For almond cream, use 1 cup soaked almonds and 1 cup of water. All will keep in the refrigerator for 4 days. If some separation occurs, just give a quick shake to homogenize before using. Full disclosure: I had never had almond milk before I got this cookbook. And being a ridiculously curious person, I decided to buy some from the store, make my own, and compare. I involved my family in the taste test. And the results were quite interesting. Both were good, but the store-bought almond milk was decidedly sweeter and smoother. The homemade almond milk (I used the basic almond milk recipe) was a bit more watery and had a fantastic nutty flavor. Making your own is always my first choice and that’s the case with almond milk, but the store-bought stuff will do in a pinch. Being a fan of cow’s milk, I don’t think I could replace my morning glass with almond milk, but I used it in a few recipes and the results were good. I even used it to make mac and cheese. Let me tell you — my family is pretty picky about their mac and cheese, and the almond milk variation was a solid success! Once you’ve made your own almond milk, The Almond Milk Cookbook shows you how to use it in recipes for smoothies, soups, sauces, pasta dishes and more. The “Sweet Tooth Central” chapter has almost 30 recipes for treats like pumpkin pie, caramel and fudge sauces, truffles, and ice creams. 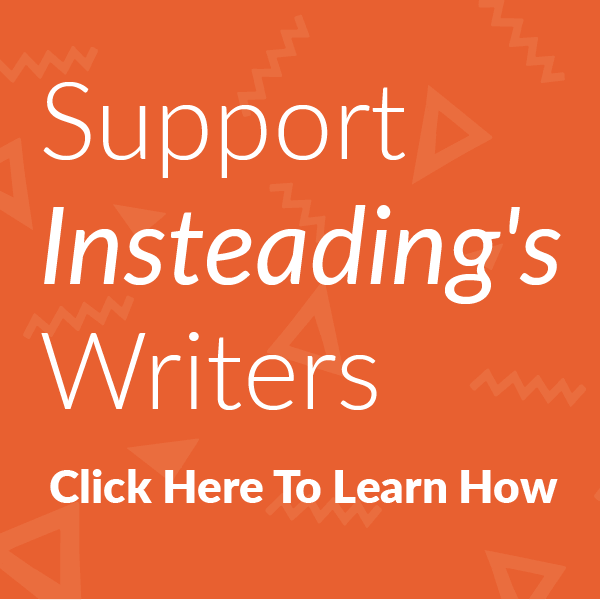 My favorite chapter is “Mains and Sides” which showed me how to use my almond milk in creamy pasta sauces and some of my standard side dishes like mashed potatoes. I’m excited to give this new staple of mine a try as a milk substitute in these and other dishes. The author and publisher have graciously allowed me to share a couple of the recipes with you. Enjoy! Almost everyone is familiar with traditional red gazpacho, but this cold, tomato-free version, known as ajo blanco, was its precursor. 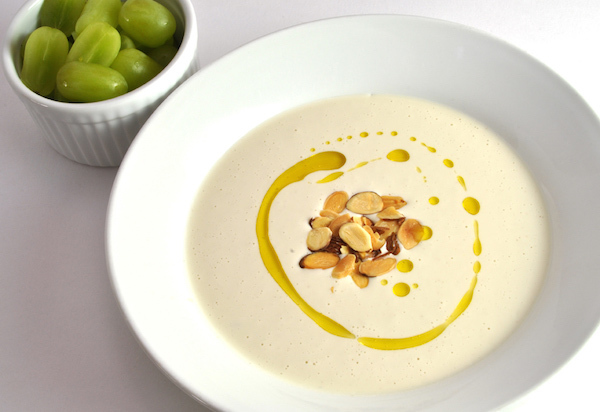 In Spain, it’s traditional to serve the soup with grapes, either on the side or in the soup. To make the soup, put the bread cubes, water, blanched almonds, almond milk, garlic, and salt in a blender and process on high speed until very smooth. This could take 2 minutes or longer. With the motor running, pour in the oil and vinegar. Put a fine-mesh sieve over a medium bowl and strain the mixture through it. Cover and refrigerate until cold. This can be done up to 2 days in advance. To prepare the garnishes, preheat the oven to 400 degrees F. Spread the sliced almonds in a thin layer on a baking sheet and bake them for 5 to 7 minutes, until lightly toasted and browned. Transfer to a cool baking sheet or large plate and let cool completely. Cut the grapes in half lengthwise and put them in a small bowl. Both the toasted almonds and grapes can be prepared up to 1 day in advance. Garnish each serving of soup with one-quarter of the toasted almonds, placing the almonds in the center of the soup. Drizzle olive oil around the almonds. Serve at once, accompanied by the bowl of the grapes. Tip: The germ is a small sprout in the center of a garlic clove. It’s often in the process of turning green, either at the tip or all the way to the root. Because the germ can be bitter and cause indigestion, it’s a good idea to remove it. Chef’s Note: When the Muslims conquered Spain in 711 CE, they brought with them advancements in science, astronomy, mathematics, art, architecture, and of course, cuisine. One dish that had its origins during that time is sopa de ajo blanco. Gazpacho came along centuries later, after conquistadores brought tomatoes and peppers back from the New World. Note: Analysis is based on all ingredients prior to straining. Pappardelle are flat noodles about one inch wide that are usually served with rich creamy sauces and gravies. 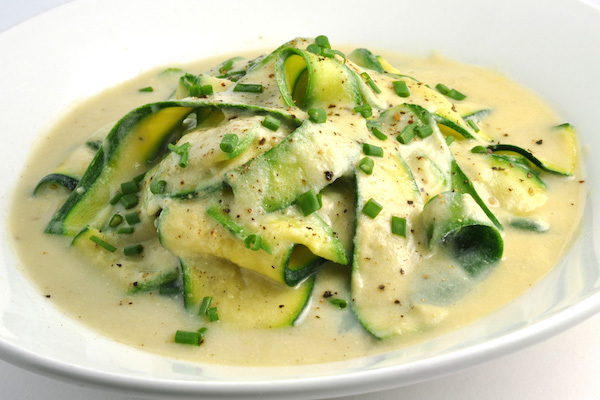 In this dish, thinly sliced zucchini stand in for the pasta. Look for young zucchini, not much thicker than your thumb, for the best results. Put the oil and onion in a large saucepan over medium heat and stir well. Spread the onion out to evenly cover the bottom of the saucepan. Decrease the heat to low, cover, and cook, stirring occasionally and spreading out the onion again, for 30 minutes. If the onion is sticking, add 1 tablespoon of water. Do not let the onion brown. Add the corn, almond milk, garlic, and salt, and stir to combine. Increase the heat to medium-high and bring to a boil, stirring constantly. Decrease the heat to medium and cook, stirring frequently, until the corn is tender, about 8 minutes. Transfer to a blender and process on high speed until smooth. Return to the saucepan and cook over medium heat, stirring occasionally, until the sauce is thick enough to coat a spoon, about 10 minutes. Add 2 tablespoons of the chives and stir to combine. Fill a large saucepan halfway with water and bring to a boil over high heat. Add the zucchini and cook, stirring occasionally, until just tender, 1 to 2 minutes. Drain well and add to the sauce. Toss gently but thoroughly. Season with salt and pepper to taste and toss again. Garnish with the remaining tablespoon of chives and serve at once. Tip: A mandoline is very helpful for obtaining thin, uniform slices of zucchini. Note: Analysis doesn’t include sea salt or freshly ground black pepper to taste. 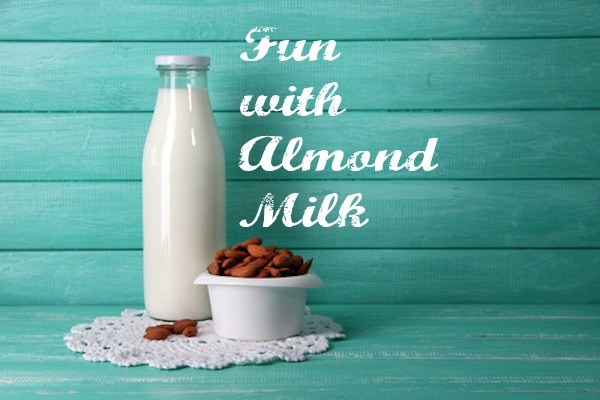 If you’ve got some exciting ways to make or use almond milk, feel free to share them in the comments. And if you give the cookbook a try, let me know how you like it!